Normally I'd save articles for Monday, unless it is a spoiler week, but I just felt like analyzing all five swords made (and instead of the original art of Fire & Ice and Light & Shadow by Mark Zug, I have the new art here, which personally I like better). With these swords, have you noticed that three of the swords are held by right hands and two of them with left hands? Also, for each hand, the sword is orientated a different way. Also, with the two blades on each sword, did you know that the only color not to appear on the front blade (the one with the guard directly under it) is black? Each color is used on two swords, and black is on the back blade of the Sword of Light and Shadow and the Sword of Feast and Famine. Red is the only color to be on the front blade of two swords, appearing on the Sword of War and Peace and the Sword of Fire and Ice. 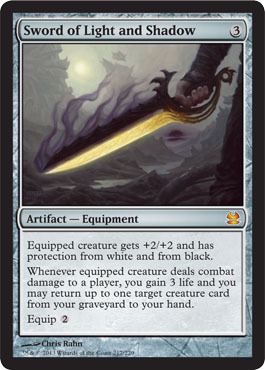 Before Scars of Mirrodin was released (and I suppose you can include From the Vault: Relics), no sword had green included as there were only the two swords from Darksteel. 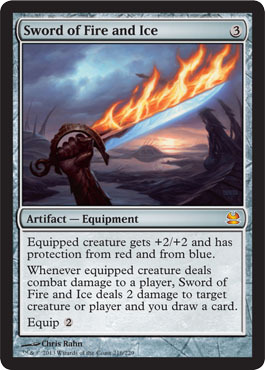 Also, until Modern Masters was scheduled for release and until we got to see the previews, there were three mythic rare swords and two rare swords. Hopefully you have enjoyed this history lesson in the Swords from Mirrodin.